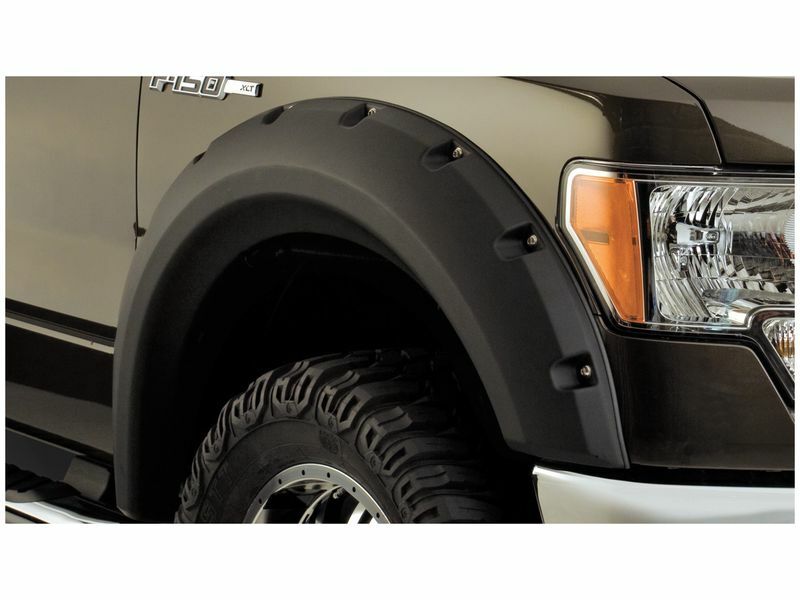 If you really want to beef up your truck, Bushwacker® Max Coverage Pocket Style® fender flares are just the ticket. They give you the most protection along with extra tire coverage for your truck or SUV. Plus when it comes to fender flares for trucks or Jeeps, no one does it better or easier than Bushwacker®. The rugged Dura-Flex® material Bushwacker uses for their fender flares is 100% UV protected against fading or chalking without looking cheap or flimsy. Bushwacker makes sure the material is thick enough to resist warping or cracking, even under extreme temperature conditions. Don't forget about style, Max Coverage® fender flares give any truck or Jeep an extreme off-road, bolt-on look. For those that want to go the extra mile for a truly custom look, you can have your new fender flares painted any color you desire. Even if you don't want to hassle with painting the textured finish looks great in black. Bushwacker® Max Coverage Pocket Style® fender flares are very easy to install right in your own garage. All you need is a little time since they are custom designed to use factory holes and there is no drilling required for most models to get a perfect fit. Pocket style fender flares are sold by the pair for the front or rear or as a complete four piece set. Beef up your look and maximize protection for your truck with made in the US Bushwacker® Max Coverage Pocket Style® fender flares! Not only are they American made, they come backed with a lifetime warranty. Order yours today! Max Coverage Pocket Style® fender flares are pretty easy to install and most vehicles won't require you to do any drilling, they just screw into place using existing holes in the lip of your fenders. Detailed instructions are included and you should have no problems following them but if you would like more information or have any questions, don't hesitate to give us a call.